Typically when one is setting routes through an interlocking you align switches, set traffic and then display a signal. The logic checks to make sure that there are no conflicting or opposing movements. In fact the US&S system of L and R levers (evolving into the often copied E-W/N-S) system works on the presumption that opposing train movements will never exist under any circumstance. Well...never say never. Now I first noticed this exception on the NJT RiverLINE in Burlington, NJ, but since I don't have a good photo of that example I will throw to the former Seaboard Rocky Mount Yard in Rocky Mount. NC. 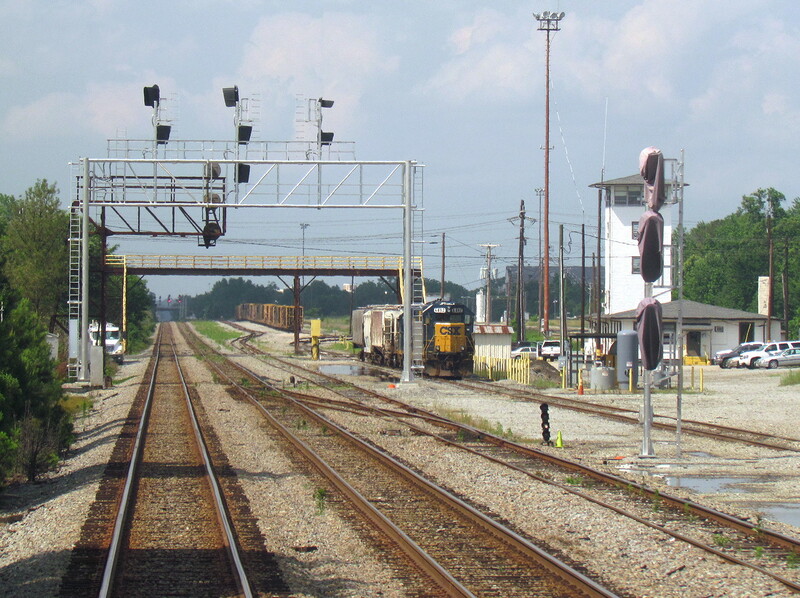 For those of you who might frequently pass through DI interlocking adjacent to the yard, you may have noticed that the signals governing movement on an interlocked yard track were always lit to display a Restricting indication...even after the interlocking was re-signaled. Either the dispatcher is always expecting a northbound yard movement or the interlocking can do something special. As you might guess it is the latter. Because the yard track has a straight movement from a yard track and to a yard track, the signaling logic is set up to permanently display Restricting on the two opposing yard track signals until the special bi-directional route is canceled. To avoid needing to get the dispatcher involved with every little yard move, he/she can fleet the signals in both directions at the same time. It is almost like the interlocking ceased to be there until it was needed. I spotted a similar setup at the new interlocking installed for fruit trains near Schenectady on the CSX Selkirk Branch. Once again there was a through yard track with interlocked crossovers onto the main. Sure enough the interlocking can fleet in both directions when only yard moves are called for. I'm not 100% sure if these signal will drop to Stop when a train actually inters the interlocking. 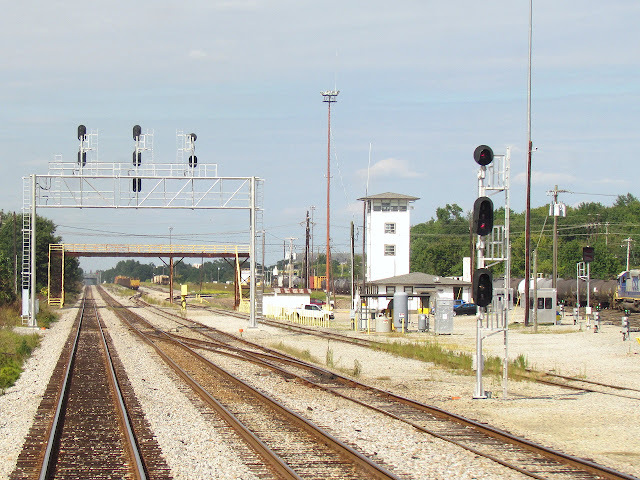 The old PARK interlocking would do that in automatic mode, flipping up t Restricting when the train passed, however this situation was one of the last uses for mechanically operated semaphores that could be set to Resreicting and then just left there, regardless of track occupancy. There is a practice similar to this in the UK involving the use of yellow disc or position light signal where a signal at Stop can be passed if the driver determines the points are set for the tail track instead of the main. Not exactly the safest practice, but the spirit is the same. Generally referred to as a "Drill Signal". On Amtrak's NEC there's one at Bay Interlocking on the Ladder Track. I've also seen this setup at St Joseph Mo and Clovis, NM. The Restricting signals on either side allow yard moves through the plant without having to contact the dispatcher for even move yet still aloow access to the main line when needed. Thanks for the info regarding the name. I figured they were called something. Woah, great catch. I'll need to update the post. What does it mean to "fleet the signal"? It means that a controlled signal behaves as if it were an automatic. Displaying automatically in accordance with block conditions. So is it a mode that the interlocking operator would toggle off when setting a main to yard or yard to main movement, and then on again once finished? Or does the machinery just "know" to operate in that mode when no such move occurring? Fleeting is something the dispatcher or operator sets when they have multiple movements using the same route. In this case with a headshunt signal, the train can travel back and forth through the interlocking as many times as necessary.